Cultural holidays: Although a relatively small holiday resort, Pineda de Mar holidays have a rich history with several ancient sites and places of interest. A Roman settlement was located here as far back as the 3rd century BC, with the remains of an ancient aqueduct surviving as proof of the area’s importance. Huge beach: Most holidays to Pineda de Mar are based around the beach and with good reason too. 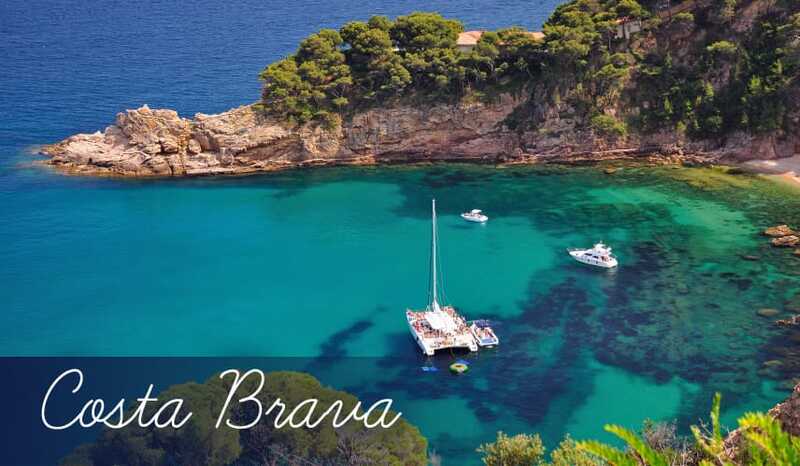 It’s one of the best on Costa Brava – a 3km long expansive stretch of golden sand that is kept extremely clean. Relaxed atmosphere: While there’s a good deal to do and landmarks to see on holidays to Pineda de Mar, it’s certainly not as busy as some of the other holidays to the Costa Brava. And you can certainly say that the sedate pace of life here makes for very relaxing holidays. Roman Aqueduct: The Roman Aqueduct in Pineda de Mar was estimated to be around 3.5km in length when it was fully functional. Unfortunately only four arches now remain, but they’re still impressive structures and give great insight into the building methods used by the Romans. Montpalau Castle: The site for this castle on Montpalau hill has a chequered history which can be traced right back to Iberian settlements in the 4th century BC. Clearly, the hill was considered to be a tactical location for defending Pineda de Mar when the first medieval castle was built here in the 11th century. Some of the walls of the original castle remain, but they now adjoin onto the second castle which was built in the same site of Pineda de Mar during the 15th century. St James Tower: Another building which highlights Pineda de Mar’s need in the past to defend itself against attacks from the sea. Watchtowers were built all the way along the coastline of Costa Brava, and St James Tower is one of the best examples of these highly specialised structures you’ll see on holidays to the region. The tower dates back to the 16th century when pirates ruled the seas and could pillage coastal towns at any moment. Montnegre National Park: Just 7km away from the town of Pineda de Mar, you’ll discover this huge national park. In contrast to the more arid landscapes in the parks in Costa Blanca and Costa de Almeria, Montnegre is surprisingly green and leafy. You can enjoy beautiful walks through dense forests of pine, oak and cork which almost make you feel like you’re in the fields of Northern Europe rather than the sunnier climes of Mediterranean holidays! Pineda de Mar Beach: There’s only one beach on Pineda de Mar holidays, but it’s large enough to be the only one you’ll need! A 3km long stretch of golden sand, it’s very wide too, expanding to 45 metres at some points. Awarded Blue Flag status for its cleanliness, the beach is well facilitated with 65 showers and a smooth palm-lined promenade which follows the entire coastline. And being a public beach, it’s completely free, making it a very cheap way to enjoy the sun on your holidays. Can Pepes: This restaurant has a long and illustrious history, serving very satisfied diners on their holidays in Pineda de Mar for over 30 years. Obviously being popular for this long proves the restaurant must be doing something right! Maybe it’s the friendly atmosphere, or the large romantic terrace, or maybe it’s actually the high quality of the food! The Pepe’s chicken and chips in particular is the most famed dish, with the succulent juicy meat served on the bone in a straw basket. The fruity sangria here is also highly recommended. The prices are pretty great value too, ensuring cheap holidays to Pineda de Mar stay cheap! Diagonal: The simple whitewashed decor of this Spanish restaurant belies a truly traditional eating experience for your holidays to Pineda de Mar. Its diverse menu incorporates the best dishes the Mediterranean has to offer, including an unusually-coloured jet black squid ink dish, lamb seasoned with rosemary and lemon, and mixed seafood served with alioli (garlicky mayonnaise). In fact the food is so delicious, even if you’re having all inclusive holidays in Pineda de Mar it’s still worth eating here. Tradescantia: Being on the Costa Brava, Pineda de Mar holidays are within the Catalan region of Spain. You’ll see the Catalan culture in many different areas on holidays here, and particularly in this authentic Catalan restaurant which serves home-cooked food made with locally-sourced ingredients. The menu is surprisingly innovative with exciting dishes like Serrano Ham with Mangoes, Pasta with Onion Sauce and Fried Chicken with Orange Peel. Hotel entertainment: Pineda de Mar holidays are some of the quietest on Costa Brava, so you won’t come across a huge selection of bars and clubs here. However, that’s just how some people like it, as the evenings offer the opportunity to relax on their holidays. The lack of nightlife has also helped the Pineda de Mar retain its Spanish character and remains relatively unspoilt. Besides, most of the hotels in the area, especially the ones with all inclusive holiday packages, provide nightly entertainment shows with live singing and dancing, so there’s still plenty to keep you occupied while you sip your drinks.